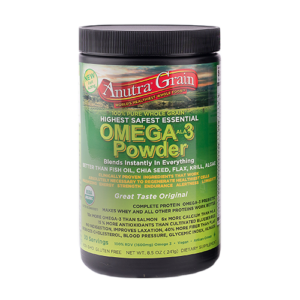 When you purchase a 30-day supply of our Omega-3 Powder(Great Taste Original), we will include 2 Bonus Items ! We will include 1 Anutra Bio Serum 15ml Bottle. A $39.99 Value. We will also include the Anutra Omega-3, The World’s Healthiest, Best Tasting Chocolate Bar. A $3.99 Value. 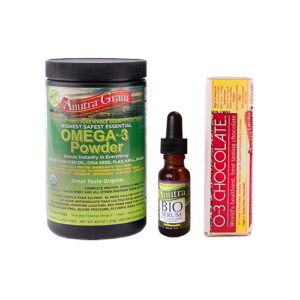 When you purchase a 90-day supply of our Omega-3 Powder(Great Taste Original), we will include 7 Bonus Items ! We will include 3 Anutra Omega-3, The World’s Healthiest, Best Tasting Chocolate Bar. An $11.97 Value. We will include 1 Cannister of Anutra World’s Healthiest No Calorie Nutritional Sweetener. A $39.95 Value. We will include 1 Bottle of Anutra Grain (Ground) Gelcaps 180ct. A $19.95 Value. 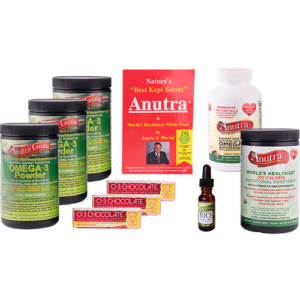 We will also include 1 copy of Anutra “Nature’s Best Kept Secret” & World’s Healthiest Whole Food by Angelo S. Morini. A $19.95 Value.